A customer at our Bradmarsh Business Centre in Rotherham has helped to transform an area of Dinnington town centre as part of a council-funded art project. Martin Horst, owner of Rainforest Graphics, has spearheaded the project, which has seen a disused market blossom into a colourful art gallery. 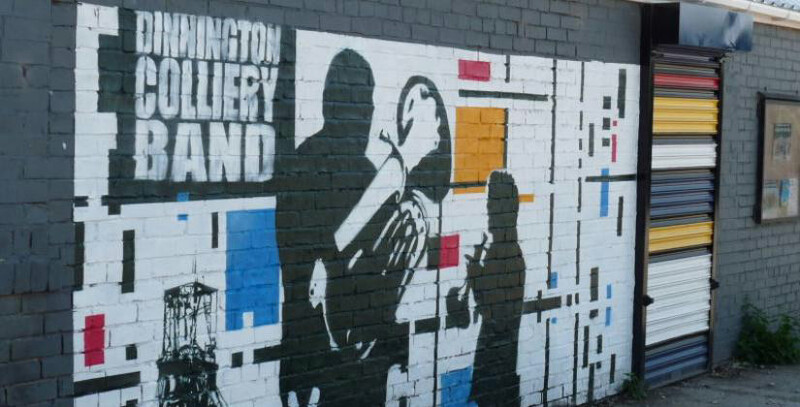 The Dinnington Gallery is supported by Bizspace and we provided a free storage unit at our Dinnington Business Centre to house any large artworks until they were needed. Martin says the gallery has brought a fresh sense of community spirit to the area. He explains: “Dinnington has a lot of new facilities, such as a bus station, supermarkets and car parking, but in between these areas and the independent retailers on the high street, there was a disused market which was a bit of an eyesore. Martin came up with the design concept and has project-managed the task, after being involved with a similar scheme in Rotherham town centre. “It really has been a community effort to improve the whole environment,” he continues. The gallery was officially opened by the Mayor and Mayoress and was attended by the children whose artwork is featured. The next element of the project will be to produce a large piece of art depicting the history of Dinnington, created by the pupils of a local primary school. “We hope that it will grow and grow,” Martin says. Martin set up Rainforest Graphics two and a half years ago, which is based in a small industrial unit at Bradmarsh Business Centre. “I chose the centre for its convenience for Rotherham town centre and also because my business unit has the ideal configuration of space for me,” Martin adds. Rainforest Graphics specialises in free-standing display systems. For more information on Bradmarsh Business Centre or Dinnington Business Centre contact Stewart Marks on 01709 782 300.